Benzoyl peroxide face washes have one primary function: to fight small to moderate cases of acne. Since acne is such a prevalent skin condition among teens as well as adults, there are numerous such products available online. So, which among these is the best benzoyl peroxide face wash for you? If you want an answer to this question, just check our shortlist below. All the brands we’ve selected here are top sellers, and have high ratings and positive user reviews. This is a medicated cleanser designed to combat even the most severe acne breakouts on your face. It can be used on other parts of your body as well. This cleanser contains 2.5% benzoyl peroxide, which is a very mild solution. The product also works on blackheads, whiteheads, and pimples, removing all three skin problems with consummate ease. Despite containing peroxide, it doesn’t cause any excessive dryness, which is a common symptom associated with the substance. This gentle pore cleanser also removes clogging dirt, and any excess oils and sebum on your skin. This is a slightly stronger face wash, with a more potent concentration of benzoyl peroxide. This might be the best benzoyl peroxide face wash for people with moderately sensitive skin and acne, as it contains a 4% solution of the active ingredient. The PanOxyl 4 creamy wash is exceptionally fast-acting, and can clear up the worst of breakouts in a matter of days. This is an excellent option for teens as well as adults. Just take into account the fact that it has a slightly stronger concentration of peroxide, which might make it unsuitable for extremely sensitive skin types. You can buy this creamy wash in packs of three tubes. 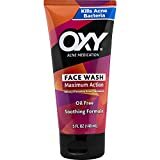 OXY Face Wash is specifically formulated to attack your acne with maximum strength 10% Benzoyl Peroxide - the #1 ingredient recommended by dermatologists for treating acne. Its fresh, creamy wash formula is designed to kill acne-causing bacteria while it cleanses and soothes, leaving skin soft and healthy looking. "With 10% Benzoyl Peroxide - the maximum level allowed by the FDA for over-the-counter acne treatments. OXY Face Wash with benzoyl peroxide treats and helps prevent acne while it cleanses away dirt and oil. Its creamy rich lather will leave your skin feeling fresh and clean. OXY Face Wash with 10% Benzoyl Peroxide is Oil-Free! Excess oil production is a key factor in the development of acne, so it's a good idea to use products that are oil-free if you have acne-prone skin. Acne typically forms when pores are clogged with dirt and oil, which allows bacteria to grow and unsightly pimples to develop. Even when your skin is clear, continue using OXY Face Wash every day to help keep it that way. Use OXY Face Wash with 10% Benzoyl Peroxide as part of a daily regimen. Try the OXY 28 Day Challenge and download the free smart phone app to help you stay on track and fight acne every day. The app provides a recommended skin care regimen, sends daily reminders, provides coupons and has a progress tracking selfie function to help you see your success! If you are not satisfied with product you can return the unused portion for a full refund. You can also call 1-877-636-2677 MON-FRI 9AM-5PM (EST) with questions. If you thought 4% was too much, think again, because there is a product with a massive 10% concentration of benzoyl peroxide in its formula. Oxy Acne is a maximum strength benzoyl face wash. This means that it has the highest level of this active ingredient out there. The face wash will kill all the nasty bacteria, while simultaneously cleaning your skin and unclogging all the pores. It has a creamy, rich lather, which leaves your face feeling fresh and rejuvenated. This product is also completely devoid of oil, which is a great thing. It has a dedicated smartphone app to help regulate your skincare regimen, provide timely alerts, and help you fight acne. Benzoyl Peroxide 10% Severe Acne Cleanser- Clinically Proven Wash to Fight Acne Bacteria on Contact for Cystic Breakouts, Oily Skin, Clogged Pores, Blackhead & Whitehead Pimples for Face & Body. 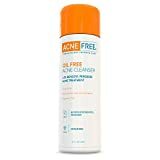 Extra Strength, clinically proven, non irritating acne treatment, 10% Micronized Benzoyl Peroxide wash for face & body. Penetrates deep within the pores and fights acne bacteria on contact to clear skin and prevent future breakouts from acne, pimples, blackheads, whiteheads, zits, and bumps. Removes dirt and cellular debris by reducing excess oil. For acne prone and oily skin. Does not over dry or cause redness and irritation. Reduces the occurrence of clogged pores. Helps to prevent breakouts before they start. Absorbs into your skin & pores for immediate results. Highly effective and safe for all skin types for men, women, teens, and even sensitive skin. Paraben and Fragrance-free. Gets to the root of the problem, stopping the bacteria in its tracks instantly. Leaving your skin glowing and oil free. Benzoyl Peroxide 10% Wash.
Join thousands of satisfied customers who have discovered the exceptional value and quality of Beauty Facial Extreme's skin care products. We invite you to visit our Amazon storefront and discover the beauty that awaits you. Beauty Facial Extreme's products work, and they work extremely well. We stand behind our products 100%, with a guarantee of significantly transforming your skin to achieve healthy and more vibrant skin. Order Now, 30 Day Money Back Guarantee. This is another face wash armed with the highest allowed concentration of benzoyl peroxide. Ten percent is the maximum approved by the FDA for over-the-counter medication in the US. This product from Beauty Facial Extreme has a very effective method of action, with a formula that penetrates deep into the skin. It removes dirt and debris, and kills all the acne-causing bacteria. This cream can help prevent and cure breakouts of acne, whiteheads, blackheads, bumps, and zits. It leaves your skin clean, glowing, and acne-free. This face wash has a very long-lasting effect that continues to fight germs long after you have washed the lather from your face. It contains the maximum 10% concentration of benzoyl peroxide allowed by the FDA. Despite the high potency, this is a daily-use formula, thanks to the use of gentle cleansing agents. It has a unique, pore-penetrating formula that results in an intense cleansing and germicidal action on your skin. This is a significant, 8-ounce body and face wash product available in a convenient pump bottle. It should easily last you a month or two, even with regular use. The product contains medical-grade benzoyl peroxide, available in a potency of 10%. This is a dermatologically-tested product, manufactured in the United States. It includes zero parabens, and has undergone no cruel animal testing. The deep penetrating peroxide formula ensures speedy action on even the worst acne and whitehead outbreaks. It can clear up your face in a matter of days. Acne treatment facial cleanser is gentle enough for daily use both AM & PM with one day application and then gradually increase to two or three times daily if needed or as directed by a doctor. This is a medicinal facial cleanser available in a five-ounce tube. It can deliver clean and clear skin that does not have any visible acne within a day or two. This is a string and potent benzoyl peroxide cream, with a concentration of 10%. It can handle even the most stubborn cases of acne with ease. If you use this one a daily basis, it will prevent future bouts, and enhance your skin’s health and glow. This is one of the best benzoyl peroxide face wash products out there, for both teens and adults. 10% seems to be a very popular number among manufacturers of benzoyl-based acne products, including treatments and face washes. This is a very long-lasting face wash from PanOxyl. It has the added distinction of being a therapeutic-level formula, which required a prescription in the past. That is readily apparent due to the lack of any fancy logo or marketing designs on the bottle, which looks more like a bottle of prescription medication. 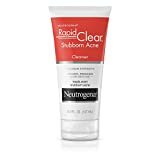 This is a very strong benzoyl peroxide face wash that can handle severe cases of acne. For face, body & back. Made in USA in a FDA/cGMP compliant facility. NOT HAPPY? EMAIL US DIRECTLY for a refund. 100% satisfaction or your money back. This is another maximum-strength, peroxide-based face wash not suitable for sensitive skin. The potent face wash can kill acne-causing bacteria with consummate ease. This is a non-foaming lotion-type product that is readily absorbed by the skin for maximum effect. It contains no parabens, SLS, fragrance, or any animal byproducts. It has a very high EWG rating, and is manufactured in an FDA-approved facility in the US. Replenix 5% Benzoyl Peroxide Wash, Advanced Acne Cleanser for Face and Body, 6.7 oz. Benzoyl Peroxide wash cleanses skin, helping to kill acne-causing bacteria and prevent future breakouts and blemishes from forming. Benzoyl Peroxide wash is a therapeutic, soap-free acne cleanser that effectively treats acne-prone skin without drying or irritation. Apply acne cleanser to wet skin and massage gently. Rinse clean with water. Use 1-2x daily. The best benzoyl peroxide face wash on our list is a reliable product that doesn’t try to overload your face with a maximum dosage of the active ingredient. This face wash from Replenix contains only 5% benzoyl, which is more than enough to deal with most cases of acne, whiteheads, and blackheads. It has a very effective cleansing action, and can kill all the harmful bacteria on your face. This product is designed for normal and oily skin types, and it is a much safer option for sensitive skin types as well. There is a widespread tendency among manufacturers to create maximum-potency benzoyl peroxide anti-acne products. This creates a perception that the best benzoyl peroxide face wash needs to have 10% of the substance to kill acne. This is a misconception, and in many cases, even a 2% solution can get the job done just as well. We hope you found our shortlist both informative and useful. Kindly consider sharing your thoughts on the best benzoyl peroxide face wash you’ve ever tested down below.